Statistical Skier : Are My Lists Of Improved Skiers Correlated With Age? 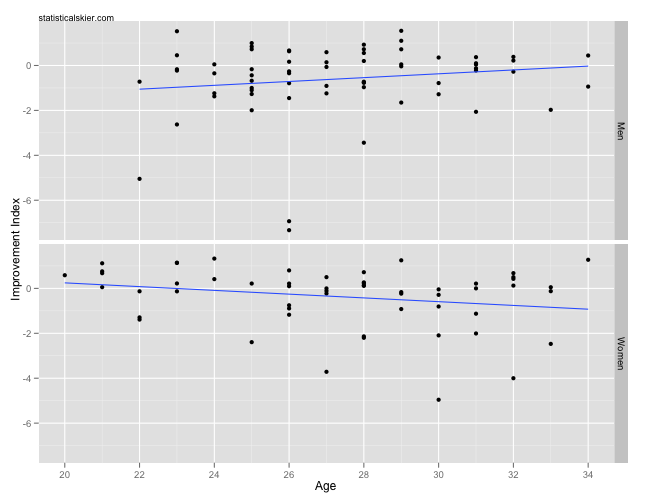 Are My Lists Of Improved Skiers Correlated With Age? The y-axis (Improvement Index) has no units, so don’t try to interpret it. It’s just the mash-up of several ways of measuring changes in performance I used to rank the skiers. Lower values are bad (un-improvement) higher values are good (improvement). The relationship is statistically significant for both men and women, although as you can see from the scatterplot, the practical lessons we can draw from it are limited. Older skiers are, on average, more likely to see a year-over-year decline, which isn’t terribly surprising. Using this measure, it’s difficult to interpret the magnitude of the decline, since my “Improvement Index” doesn’t have any sensible units. So it’s not really clear what a decline of 10 on this index means, practically speaking. Once again, this “Improvement Index” has no meaningful units (and it’s on a completely different scale! ), but lower values are bad (un-improvement) and higher values are good (improvement). Neither of these relationships are statistically significant. 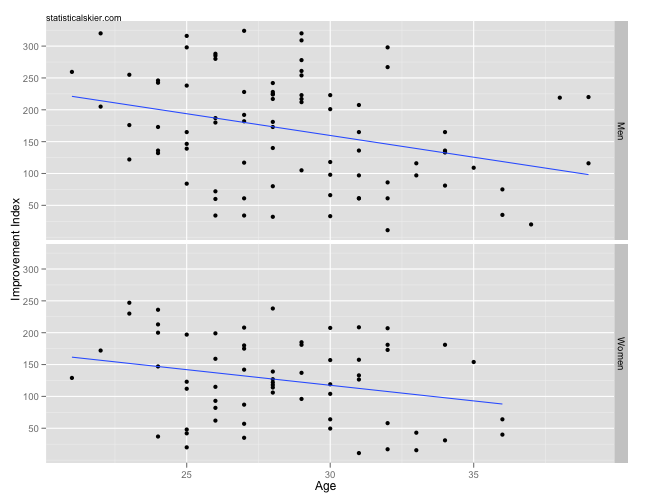 This is kind of interesting to me, since I would have expected sprinting (generally considered friendlier to younger folks) to have a stronger relationship with age than distance skiing. One possible explanation is the sprinting hasn’t quite been around long enough to accumulate enough older sprinters for us to see much of an effect. Posted by Joran on Friday, May 13, 2011, at 6:00 am. Filed under Analysis, Cross Country. Tagged Age, Distance, men, most improved, most unimproved, Sprint, women, World Cup. Follow any responses to this post with its comments RSS feed. You can post a comment or trackback from your blog.